Motivational InterviewingIf you’re a coach, a health-care practitioner, a consultant, a therapist or a parent of adolescents, you’ve probably realized that taking the “expert” role and telling another person what to do often doesn’t work, and can leave you–the change agent–feeling frustrated or even futilely arguing for the change. In an era where confrontational strategies were the norm in addictions treatment, Dr. William Miller developed a radical alternative, Motivational Interviewing (MI). His approach evolved by observing what worked in his own experience with clients–honoring people’s autonomy in choosing goals, evoking the inherent desire to change, and taking a partnering rather than “expert” role in dealing with change. Motivational interviewing is a form of collaborative conversation that calls forth and strengthens an ambivalent person’s own motivation and commitment to change. Within a safe and empathic relationship, a client with some ambivalence can identify inner resources and skills that will help in initiating and maintaining a desired behavior. Great attention is paid to the language of change and on facilitating a client’s “change talk” rather than confronting, directing, or otherwise promoting client change from outside. In an ambivalent client, those strategies may actually prompt a client to reflect the other side of the ambivalence–to hold on to the status quo or “sustain” a potentially dangerous behavior. In MI, when this kind of “resistance” surfaces, it serves more as a signal to modify the change agent’s style and strategy than as a label for client behavior. Ambivalent clients are more likely to change and maintain behavior change when they can voice arguments for change, literally talking themselves into moving towards their own goals. MI had its early beginnings in the 1980’s when Bill was on sabbatical in Norway. Bill had worked extensively with both behavior and client-centered Rogerian therapies and was asked to help new psychologists by demonstrating therapeutic responses in role-plays of difficult client encounters. With intensive questioning from the novices, he was able to identify and then document decision rules he was intuitively using in clinical practice. Always interested in collaboration, he offered what he’d written up to a colleague, who nudged him to publish even without data. Years later, in a second sabbatical in Australia, he happened to meet another psychologist, Steve Rollnick, who had relied on this one published paper to train a growing number of addictions practitioners in the UK in the basics of motivational interviewing, and wanted more information about it. 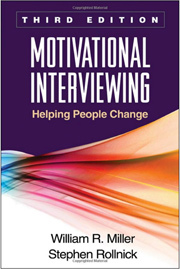 Together, Bill and Steve wrote the first edition of Motivational Interviewing: Helping People Change. Extensive research since then has identified two essential active components of MI: a relationship component focused on empathy and the interpersonal spirit of MI, and a technical component involving the differential drawing out and reinforcement of clients’ “change talk.” Continuing research has confirmed MI’s efficacy when used alone (even in one session), with assessments, and when added to other effective treatment procedures. It has become a standard tool wherever there is ambivalence in client decision-making and goal setting: health care, corrections, other substance abuse and addictions treatment (e.g. smoking, gambling), and management of chronic mental disorders. It has now been translated into 16 languages, and MI training has been done internationally in over 30 languages. The Motivational Interviewing Network for Training estimates that, internationally, close to 1500 trainers have fostered MI training with many more practitioners, who then make use of this method when working with ambivalent clients. The latest version of Bill’s book is the 3rd edition–a bestseller for professionals and students and an authoritative presentation of MI’s powerful approach to facilitating change in ambivalent clients. The book spells out the four processes of MI–engaging, focusing, evoking, and planning–and demonstrates what they look like with vignettes and interview examples. In addition, the 3rd edition reflects major advances in understanding, teaching, and assessing the fidelity of MI, and reviews the growing research base supporting its effectiveness across various populations and conditions. William R MillerDr. 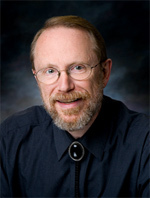 William R. “Bill” Miller is Emeritus Distinguished Professor of Psychology and Psychiatry at the University of New Mexico, where he joined the faculty in 1976 after receiving his Ph.D. in clinical psychology from the University of Oregon. With Stephen Rollnick, PhD, he is the founder of Motivational Interviewing. He has published 50 books and over 400 articles and chapters. For 40 years, Bill’s overall research interest has been the psychology of change. In particular, he has focused on the development, testing, and dissemination of behavioral treatments for addictions as well as self-regulation and motivation for change. His interest in addictions work stemmed from his experience working with alcoholics during a summer VA internship: he came knowing nothing about alcoholism, asked open-ended questions like “what’s been happening in your life?” and “where are you going from here?” and listened to their stories in a fully Rogerian fashion. After he was tenured in 1982 at the University of New Mexico, he was presented with opportunities in collaborative conferences, panels, and publications to explore another of his passions: the relationship and integration of spirituality, psychology, and addictions. With a vision of the future, he wrote about spirituality as a cutting edge area for health research and edited one of the first books on spirituality published by APA. He has led seminars in positive psychology and self-fulfilling prophecies, exploring how change happens, how clinicians can facilitate it, and how people can make positive choices in their assumptions and experience. And he has contributed insights and material on psychology to the pastoral counseling literature. Bill was born in a little coal mining in Appalachia and was the first in his family to go to college. He thought at the time it would be preparation for Seminary, but he questioned his faith by the time he was a senior. However, he had been inspired by his mentors at Lycoming College to pursue challenging questions with solid scientific methodology, and chose graduate school instead. When he went off to the University of Wisconsin in 1969, he’d never been west of the Pennsylvania state line. He was a left-leaning, long-haired, guitar-playing hippie graduate student in Madison, and when his draft number came up in the lottery after one semester, he served as a conscientious objector at the local Mendota State Hospital for two years. Ready to return to graduate school, Bill heard political conflicts in the University of Wisconsin Psychology department had virtually paralyzed the program, cutting off funding and new admissions. He transferred to his first choice school, the University of Oregon at Eugene and took off with his new wife, Kathy, whom he’d met in Madison. Four years later, he received his PhD, accepted the first academic position available in Albuquerque at the University of New Mexico, and never left except for his remarkable sabbaticals. The connections he created and the support for following his various research passions has made for a stellar and rewarding career. He attributes some advances in his upward spiral of professional development to “happenstance,” serendipitous events or connections; for example, he notes “some of the very best things that have happened in my academic career came out of sabbaticals” where he met new people or had new roles in new places. But it’s not all about what happens externally–by chance. 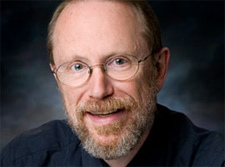 Bill’s integration of client-centered Rogerian and behavior therapies, his interest in collaboration with colleagues and clients, his strength of curiosity, his keen observational skills and adherence to scientific methodology (including learning from his unexpected results) have been essential factors leading to international recognition of his extraordinary contributions to treatment for addictions and chronic health problems and to his groundbreaking work in bridging spirituality, psychology, and health. Video of Bill’s summary of Motivational Interviewing research, at Columbia University, 2009. About 60 minutes. Bill’s personal website has excellent summaries of his research findings in various areas. The Motivation Interviewing Network of Trainers (MINT) The best information about motivational interviewing. Jaffe, Eric. (2014). A Therapy Created to Treat Addiction Is Being Used to Reduce Car Reliance.The Atlantic CITYLAB. UK transfort firm takes “motivational interviewing” door-to-door.Excellent, short popular article about a simple, successful effort at social change.